Posted by Anand Mallaya in computers, internet, technology, web. This is the age of bowser based web applications. Browser like google Chrome provides a way to create webb application shortcuts to your desk top with out loading the actual browser. The interface will let you open an exclusive browser window only for your favourite application like Gmail or Facebook. No adress bars, no menus just your app. Cool eh!? Here are some tricks that will allow you to ceate standalone web applications. Sometimes these are called Rich Internet Applications or RIA 1. Firefox The feature is not built in, however there are add-ons avialable which will let you do the job.Prism is such an application. 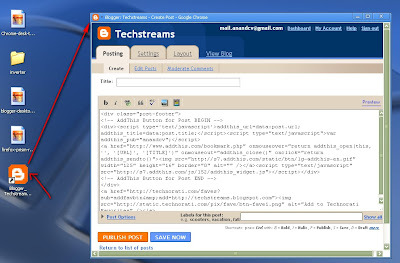 Prism allows you to run web applications (like Gmail or Facebook, for example) in a single browser window, separate from your main Firefox application. Prism is a standalone application. Now a firefox extension named Refractor is available, which does the function directly from Firefox. 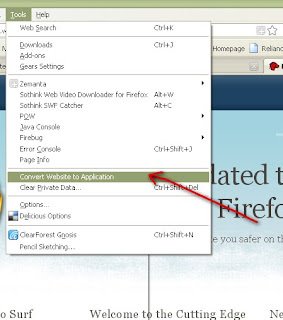 After installing the refractor add-on you can create applications right from ther firefox while you browse. An article on the Wired magazine:click here 2. Gogle Chrome. Google Chrome has this feature built in. 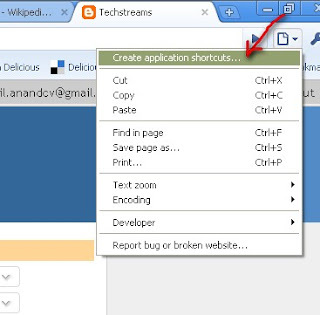 You can make any webpage a desktop application by clicking on the ‘create application’ button. The standalone blogger application looks like this 3. Adobe Air Adobe AIR is used to make completely independent desktop web applications with out needing any web browser.Though this is not for novice users, it is aa good tools for web developers. Using Adobe AIR standalone desktop web applications can be developed. You need to install a AIR runtime on your operating system. Click here for Adobe AIR page You can get lot of applications by googling. Here are some popular links: http://www.adobe.com/products/air/showcase/ http://www.sizlopedia.com/2008/03/08/10-most-useful-adobe-air-applications/ http://www.readwriteweb.com/archives/some_adobe_air_apps_worth_a_look.php 4. Google gears Google gears is a software which enables offline functionality to web application.Once offline, Gears saves all work on local database on your computer, you can still work with out internet connection. The next time when you gets the connection, Gears syncs the changes to the server. This combined with the desktop app featrures, is creating the ways to the RIA (Rich Internet Applicaation}.